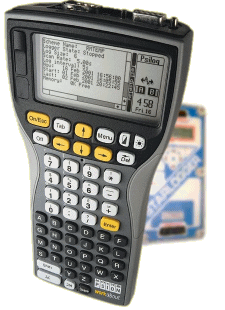 The PsiLog software package allows the unloading, programming and testing of Unidata loggers on site via Psion handheld computers, in particular the Psion Workabout. It is an easy to use package that is compatible with your existing Starlog version 2 or 3 software system and provides robust and reliable support of your dataloggers while in the field. PsiLog has not been tested with the new Unidata Starlog Version 4 software. You must select the compatibility option in Starlog V4 to generate extra scheme files. Starlog V4 does not work with Starlog V3 unload files. You must unload your logger on the Workabout to get the data. You can then export that data as a CSV file that Starlog V4 can understand. More detailed compatibility information will be published soon. PsiLog is available directly from Southern Cross Software Solutions. Please contact us via email: <sales at scss dot com dot au>. PsiLog software on a 3½" floppy disk. A Psion Workabout or other compatible Psion handheld computer. Two serial cables, one for connecting your Psion to your PC (a "null-modem" cable), and one for connecting your Psion to your data logger(s) (a standard straight-through cable the same as what you'd use to connect your PC to your data logger(s)). We can supply Psion Workabout computers and suitable serial cables. For pricing information, contact us via email: <sales at scss dot com dot au>. Please note that we do not export Psion Workabouts. Starting with V1.15F of PsiLog, MS-DOS is no longer supported. Starting with V1.16F, Windows 3.x is no longer supported. If you need PsiLog to work with either of these operating systems, please contact us via email: <support at scss dot com dot au>. The PsiLog history lists all the changes that have been made to PsiLog, including new features and bug fixes.